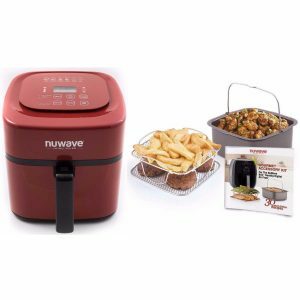 The red Nuwave Brio is an extra large 6-quart capacity air fryer with an advanced touchscreen display and three separate wattage controls to cook great tasting meals with little or no oil at all. It lets you air fry, grill, roast, bake, toast or broil your ingredients like fries, mozzarella sticks, chicken etc. There are six preset options for fish, nuggets, fries, frozen fries, poultry and steak. Or if you want to do your thing, you can set the temperature between 100 and 400 degrees Fahrenheit and 5-degree increments. You may also program the digital timer up to 100 hours. You can even adjust the wattage between 900W, 1500W and 1800W. You have the preheat button if certain ingredients need preheating and reheat button that will be at 360 degrees Fahrenheit for four minutes. 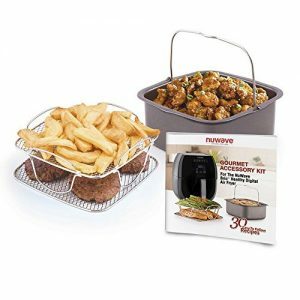 Nuwave Brio Air Fryer weighs 17.5 pounds and measures 9.1 x 9.1 x 9.1 inches. You can purchase it in blue or red and both have the same price tag on the day of this review and comes with a convenient gourmet accessory kit. There is a basket divider that will keep your different meals separate during the cooking process. Your ingredients will turn out crispy on the outside and soft and moist on the inside. Frozen fries or burgers will take longer to cook than fresh ingredients but they still cook nicely- crispy and juicy. One of the customers mentioned that the meat may stick on the basket and that it was not easy to clean. One thing to keep in mind is this is a large cooker with an extra large basket so the ingredients may be a little less crispy than smaller units. Despite the small flaws it seems to do what it is supposed to do very well. You will be able to cook for the whole family and guests at the same time. And you can also easily work with smaller amounts too. They will not be able to tell the ingredients were not deep fried in oil. It will be pretty much the same taste without any added oil or fat. On the touch display panel, you will find the six preset for different food items, time and temperature up and down, menu, pre-heat, watts, start/pause, reheat and on/off buttons. It is good that the gourmet accessory kit is included in the box, as they are not cheap for purchasing separately, costing around fifty dollars. You have the non-stick baking pan, a stainless steel reversible rack, and a recipe book.